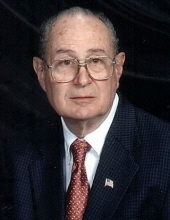 Larry Ross Seelinger, 83, of Raymore, formerly of Pleasant Hill, was born, November 23, 1935, in Butler, the son of Lyle R. and Mildred C. (Verguson) Seelinger. He departed this life, Saturday, January 12, 2019, at his home surrounded with love and family. Larry became a Christian at the age of 16 and was a 1954 Butler High School graduate. He went on to study Theology at William Jewell College. On May 9, 1954, he was united in marriage to Elzora Arlene Myers in Butler. Larry was employed as Master Electrician, carpenter and mason. He had also worked for J.C. Penney, Sprouce Reitz, and Vendo. He was very heavily involved with the Boy Scouts of America for over 15 years, including scout master, and held many other various district positions. He was a tribal council member of the Tribe of Mic-O-Say, an honorary camping association of the B.SA. He took many boys to the high adventure camp in Philmont. He was Deacon Emeritus of the Big Creek Baptist Church, Pleasant Hill. He had also traveled across country with the New Faith Baptist Builders as their Master Electrician, helping to start numerous new churches over the past 14 years. Larry was preceded in death by his parents; two brother’s Charles Seelinger and Lyle Seelinger; and one sister, Myrna Smith. He is survived by his wife Elzora of the home; two sons, Shelby (and Susan) Seelinger of Warrensburg, and Alan (and Ada) Seelinger of Raymore; one daughter, Glenda (and Guy) Lenox of Raymore; four grandchildren, Shelby (and Bonnie) Seelinger, II of Warrensburg, Kathryn Lenox of Nixa, Shauna (and Dylan) Crews of North Kansas City, and Karalyn (and Brandon) Gibbs of Lee’s Summit; 6 great grandchildren; one brother, Gerald (and Becky) Seelinger of Sedalia; one sister, Roma (and LaVerne) Welch of Adrian; several nieces and nephews; other relatives and friends. Visitation was held Monday, January 14, 2018, at the Stanley-Dickey Funeral Home, Pleasant Hill, Missouri. Funeral services were held Tuesday, January 15, 2019, at the funeral home. Reverend Preston Sanders will officiate. Graveside services and interment was held Tuesday afternoon in the Oak Hill Cemetery, Butler. Casket bearers are Jim Alexander, Greg Anderson, Larry Colvin, Bob Glentzer Mark Gray, David Marshall, Dennis Ross, and Lloyd Ross. Honorary casket bearers are Glen Adams, Barney Barnhart, Bob Benware, Gary Farnsworth, Fred Lewis, Paul Miller, Arlen Mitchell, Gib Sudduth, and Kenny Swofford. Memorial contributions are suggested to the Deacons Fund, Big Creek Baptist Church and may be sent in care of the funeral home. To plant a tree in memory of Larry Ross Seelinger, please visit our Tribute Store. "Email Address" would like to share the life celebration of Larry Ross Seelinger. Click on the "link" to go to share a favorite memory or leave a condolence message for the family.